What Makes General Mills Stock So Great? It's true that General Mills isn't exactly an exciting company to follow if you're a stock investor. People would probably be more concerned if staples like Cheerios, Wheaties, Lucky Charms, and Pizza Rolls went through major changes than about General Mills coming up with new innovative products. But that's the beauty of the company's business and why investors should love it. It's simple, it's steady, and it's profitable. The steadiness of General Mills' business has made it a great bet for investors through some pretty turbulent times. 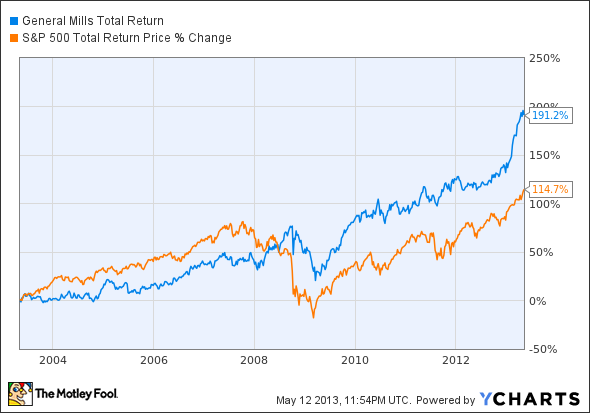 Over the last decade, the stock has easily outperformed the market on its way to nearly doubling investors' money. GIS Total Return Price data by YCharts. Over that time, General Mills has also outperformed consumer staple giants Kellogg , Procter &Gamble , and Mondelez , part of the former Kraft Foods. These companies can all boast the same scale General Mills enjoys, which is key when you're servicing the grocery market. But General Mills has managed to generate higher returns from its assets than all three companies and has a profit margin that's only topped by Procter & Gamble. These impressive financials have been the driver of General Mills stock, generating the best returns over the past decade as well. In the grocery and consumer goods retail business, the key has always been shelf space. Go through any grocery store, Target, or Wal-Mart, and you'll see General Mills, Kellogg, P&G, and Mondelez commanding a significant amount of space. That helps drive solid, predictable returns for shareholders. Once you have shelf space, the challenge is being efficient in making the goods that go on those shelves. As the table above shows, General Mills generates solid returns from its assets and manages to grow revenue at a steady clip. Finally, investors want to pay a reasonable price for a company. General Mills stock is trading at 18.3 times trailing earnings, which may not be a steal, but it's a decent price given the company's almost impenetrable position in the market. I think the stock will continue to outperform, which is why I'm adding an outperform call on my CAPS portfolio. General Mills is looking for growth overseas, but it isn't the only company profiting from our increasingly global economy. Riding this trend can be as easy as investing in your own backyard. The Motley Fool's free report "3 American Companies Set to Dominate the World" shows you how. Click here to get your free copy before it's gone. The article What Makes General Mills Stock So Great? originally appeared on Fool.com. Fool contributor Travis Hoium has no position in any stocks mentioned. The Motley Fool recommends Procter & Gamble. Try any of our Foolish newsletter services free for 30 days. We Fools may not all hold the same opinions, but we all believe that considering a diverse range of insights makes us better investors. The Motley Fool has a disclosure policy.